Below are the questions most frequently asked about Insight for Living's Conferences and Tours ministry. When and where are Insight for Living Ministries events, so I can plan my vacation? Insight for Living Ministries schedules tours of Israel and cruises to Alaska regularly. However, sometimes we get an exciting new event idea to throw in the mix . . . such as a visit to Europe to learn about the Reformation or a cruise around the Mediterranean. We would love to have you with us! Please visit our Conferences and Tours Web page for specific dates and destinations of each individual tour, cruise, or conference. Is your Israel tour always held in the spring? Usually, yes. 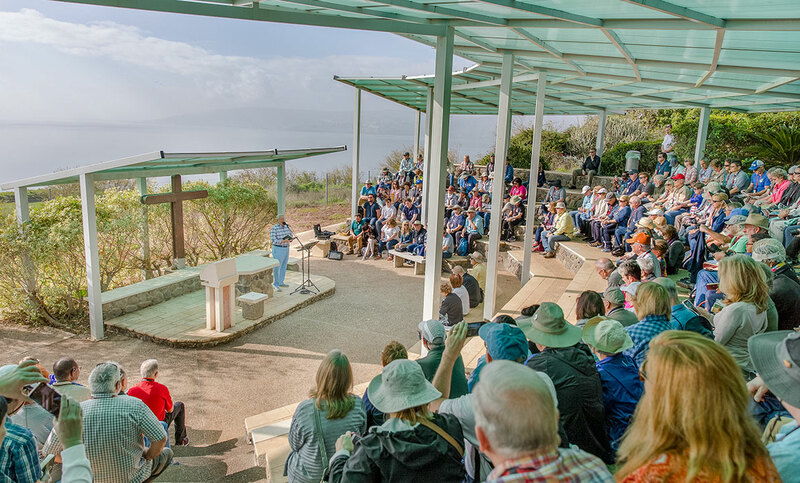 The two main reasons we schedule the tour in the spring are the mild weather in Israel at that time and the availability of the Dallas Theological Seminary professors to participate during their spring break from teaching. How many people usually attend the Israel tour? Our tour groups to Israel typically have nearly 600 attendees, with each bus containing approximately 45 people. You are assigned to the same bus for the entire trip so that you can get to know your fellow travelers. While the total group is fairly large, your bus “family” gets to know each other well as you spend quality time together. Also, each bus has two Insight for Living Ministries staff “shepherds” as well as a professor couple from Dallas Theological Seminary, who will teach and provide devotionals along the tour. Our tours and cruises have sold out in the past, so we recommend that you book as early as possible. Inspiration Cruises and Tours handles all the booking and travel details for our tours. To book any of Insight for Living Ministries’ tours or cruises, or for more information, please call 888-447-0444 or visit www.inspirationcruises.com/ifli. Do Chuck and Cynthia travel to every event? Yes, Chuck and Cynthia Swindoll are present at each conference and are excited about meeting each and every guest. Not only will you hear Chuck’s messages in person throughout the trip, but you’ll journey alongside a couple that truly loves the Lord with all of their heart and are the same on the airwaves and in print as in their daily lives. They’re worth getting to know! How many days does an Insight for Living Ministries cruise or tour last? Typically, cruises last seven to ten days, while tours are usually twelve to fourteen days. How much walking or physical activity is involved? Land tours require physical activity. You need to be in good health, able to climb stairs without assistance, walk at a modest pace for more than a mile, and able to transport your own luggage. On tours, be prepared for vigorous to strenuous walking, hiking of steps, and navigating uneven terrain; you will benefit greatly if you exercise and train prior to departure for these physical fitness requirements. Access at the touring sites is very limited for those who use a cane, walker, or wheelchair. Cruises offer a more relaxed atmosphere, with a variety of activities available to you depending on your physical capabilities. Sorry, Insight for Living Ministries does not offer scholarships or discounts at this time. How much does a tour, cruise, or conference cost, and what does it include? Costs fluctuate based on the market, destination of choice, programming, and so on. Please visit our Conferences and Tours Web page to learn the unique features and pricing details for each individual event. Why are Insight for Living Ministries cruises and tours more expensive than others? Insight for Living Ministries offers competitive pricing when compared with other events of similar length and destinations. Our travel partner, Inspiration Cruises & Tours, often secures unique deals and service no other travel company can provide. That said, we will sometimes have a slight increase in the price of our conferences compared to others due to the costs associated with our excellent programming and entertainment, logistics management, and attentive care and service provided to give you the unmatched Insight for Living conference experience! Can I go through another agency to make my tour or cruise arrangements but still join Chuck's sessions? Regrettably, that is not possible for a variety of reasons. Insight for Living Ministries has been providing cruises and tours for more than 25 years, and during that time we have learned a great deal about making these events both well-organized and spiritually invigorating. We have also developed a longstanding relationship with Inspiration Cruises & Tours (ICT), which capably handles the myriad details that go into planning an exceptional event. When you register through another agency, you become their customer and not ours. That agency then determines your room assignments, dining reservations, and anything else included in their package. Additionally, because Insight for Living Ministries cruises and tours are usually sold out, space and printed materials are limited to our own customers. It is imperative to keep all of our customers under a single agency so that the skilled people at ICT can be assured of accounting for all the details associated with your trip and ensure that the event is the absolute best that it can be. Can I get a refund if I need to cancel? Refunds are available up to a certain point, though cancellation fees will apply. You’ll find the accurate information in the brochure for your specific event. Why don't you host more affordable events for those who can't afford a tour or cruise? In an organization like Insight for Living Ministries, almost every choice we make can potentially cause someone disappointment. Within the family of Christ, there are a vast range of attitudes, particularly when it comes to the way people use their money, the standards of living they maintain, and how they spend their time and expend their energy. A little history about the inception of our special events ministry may help you understand why we provide cruise and tour conferences. Our first cruise took place in July 1984 as a response to many who were looking for a summer vacation that would offer an opportunity to be spiritually challenged in a conference setting aboard a ship. These people might have taken a cruise regardless or may have enjoyed sea travel in the past. They were people who loved God, sought His ways, and in most instances used their resources substantially to further the worldwide cause of Christ. The majority of individuals aboard our first cruise were not wealthy; they were simply people fulfilling a dream to take a cruise with a group of Christians . . . a dream for which they might have saved for a long time. And they were not disappointed. Many conferees told us their lives were changed as a result of the biblical teaching they received that week. People of all ages and income levels received spiritual encouragement and practical help. After much prayer and careful consideration, we chose to sponsor more cruises and tours. We have done so with a clear conscience as we examined our responsibilities both to Christ and to individuals from every economic level. As a ministry, we believe we should relate to the entire body of Christ; our ministry is by no means directed to any single socio-economic segment of the population. For this reason, Insight for Living Ministries sponsors a variety of growth-inspiring events that appeal to all types of individuals who are seeking to meet their varying spiritual as well as vacation needs. Insight for Living Ministries provides many types of ministries at various levels of cost so that no one is excluded. The broadcast may be heard by anyone with a radio or with access to our Web site. All of our listeners are invited to write to us to receive biblical counseling at no charge or, if they prefer, telephone us for biblical counseling and pay only for the call. We have a large selection of comparably priced literature, with much of it available to anyone for a donation of any amount. Do you offer scholarships or group/pastoral discounts? We regret that we are unable to provide you, your church group, pastor, or any other person with a financial contribution or group discount. The funds we have at Insight for Living Ministries are provided through donations from our radio audience. These dear donors send funds specifically to help us pay our radio bills and other ministry-related costs. We cannot divert those monies to support any other cause, no matter how worthy. To do so would simply be unethical. Another aspect to consider is that we would never be able to help everyone who asked for financial assistance; saying yes to some and no to others understandably causes offense to the ones denied. So in the interests of honorable business dealings, Christian stewardship, and fairness to all, we have had to establish a policy of declining all requests for financial aid. Do the Swindolls and other Insight for Living Ministries employees travel for free because of the number of spots reserved for the trip? This doesn't seem right for a ministry that is supported by donations. Insight for Living Ministries handpicks appropriate staff on a per-event basis depending on what will provide the best experience for our ministry passengers. Our highest concern is meeting your needs, and Insight for Living Ministries employees work diligently to ensure every detail fits the highest standard. By using Insight for Living Ministries employees, we reduce overall trip costs for everyone by not paying for extra travel company guides and management. Part of the special nature of our conferences is meeting you personally as a ministry family, caring for you and ensuring an outstanding experience. We are thankful for the opportunity to do this and to do so without using listener donations. Although the trips may seem like a “vacation” for Chuck and staff members who participate, many long, work-filled days are required in order to make each cruise or tour a success for our guests. What is the source of funding for your cruises and tours? Insight for Living Ministries tours and cruise conferences are an exceptional offering to our listenership in that they do not cost Insight for Living Ministries any money to conduct. The fees paid by the conference attendees fully cover the costs of the events. The donations of our listeners, on the other hand, go directly to supporting our day-to-day ministry efforts. We plan these annual conferences and tours because of the opportunity they provide for building personal relationships with our listeners, the spiritual benefit they offer our constituents, and the high demand from listeners for such trips. Although these trips provide only minimal funding for Insight for Living Ministries, they give us the opportunity to meet many new friends, who then choose to become regular supporters of Insight for Living Ministries and our worldwide ministry. How can Insight for Living Ministries be short on funds and yet still go on cruises and tours? We appreciate your concern, but rest assured that Insight for Living Ministries does not use donations to fund these events; we only organize and host the conferences and tours. The fees paid by the conference attendees fully cover the events. We plan annual conferences and tours because of the opportunity they provide for personal relationships with our listeners, for spiritual benefits to our constituents, and in response to their high demand. The donations of our listeners, on the other hand, go directly to supporting our day-to-day ministry efforts. How many times does Chuck speak during a cruise or tour? Chuck usually speaks six separate times on cruises and about nine times on tours. 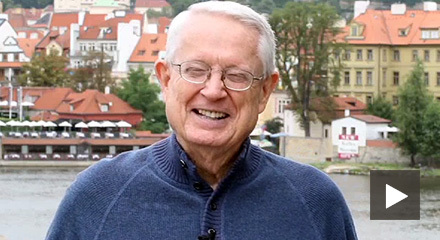 Can I be baptized by Chuck Swindoll in the Jordan River or the Sea of Galilee on the Israel tour? We do have a time scheduled for baptisms performed in the Jordan River or the Sea of Galilee. However, Chuck does not perform the baptisms. One of the Dallas Theological Seminary professors will do the honors. Anyone who wants to be baptized is welcome! There is no need to schedule it in advance. It is arranged during the actual tour. Can Chuck or a ship captain officiate my wedding? Regrettably, Chuck has an extremely busy schedule during the tours and cruises. Without the ability to accept all such invitations and personal requests and in the interest of integrity and fairness, Chuck has made it a firm policy to decline them all. If you’re traveling with Insight for Living Ministries on a cruise, the ship’s captain is also not able to perform the ceremony. Captains are not legally able to marry anyone on a ship. Should you like to get married at some point during the trip, we would suggest making private arrangements with a licensed pastor in either the port of departure or in one of the ports during sailing. I am traveling alone or with an odd number of people in my party, and I need a roommate. How does that process work? When you book your tour or cruise, Inspiration Cruises & Tours will send you a room-share program agreement for to you fill out. This form will allow you to mark your preferences for roommates, as well as make you aware of useful information related to traveling with a roommate. Why must those who are traveling alone pay an upcharge? Charging extra for people traveling alone is standard practice by most hotels and cruise lines. Therefore, these increased charges for solo travelers by Inspiration Cruises and Tours or Insight for Living Ministries reflect the higher costs incurred from hotels, cruise lines, and so on. If you would like to avoid these costs and make a new friend on your adventure, we are happy to offer a room-share program. For more information, contact Inspiration Cruises and Tours, 888-447-0444.